Orca Gold Acquires Exploration Asse | Orca Gold Inc.
VANCOUVER, BRITISH COLUMBIA--(Marketwired - Feb. 1, 2017) - Orca Gold Inc. (TSX VENTURE:ORG)("Orca" or the "Company") is pleased to announce that it has executed a share purchase agreement with two wholly-owned subsidiaries of Kinross Gold Corporation (TSX:K)(NYSE:KGC) ("Kinross") (the "SPA"), whereby the Company is acquiring from Kinross all the issued and outstanding common shares of two wholly-owned exploration companies located and operating in Côte d'Ivoire (the "Acquisition"), which collectively own and have rights to the Morondo and Korokaha North exploration licences, and five exploration licence applications (collectively, the "Exploration Assets"). Closing of the Acquisition is subject to a number of conditions, including, but not limited to, the parties receiving approval of the Acquisition by the Minister of Industry and Mines of Côte d'Ivoire. The Company does not currently have an expected closing date and there is no assurance that the transaction will be completed. The Exploration Assets comprise a land package of 2,268km2 positioned on highly prospective structural trends related to known gold mineralisation (see figure below). The Exploration Assets have received little or no exploration, the most advanced being Morondo, where a discovery was made by Red Back Mining Inc. in 2010 (best intercept 66m at 1.53g/t). Gold mineralisation has been identified by trenching and 4,284m of shallow reverse circulation drilling over an area of 600m x 200m and is open in all directions. Orca plans to explore this prospect with the aim advancing it to resource status. The Korokaha North licence and Korokaha South application lie adjacent to the east of Randgold's Tongon Mine. The Bassawa and Satama applications are located on the southern extension of the Houndé Belt. The Zuénoula Ouest and Zuénoula Est applications are located north west of Perseus's Yaoure project. With the signing of the SPA, Orca intends to expand its exploration programmes into what is one of the most prospective but least explored countries in Africa, complementing its flagship Block 14 Gold Project in the Sudan. grant to Kinross a 2% net smelter return royalty on any product mined and sold from the Exploration Assets. The acquisition by the Company of these highly prospective licences and applications from Kinross complements the applications already made by Orca in Côte d'Ivoire for licences covering 789km2. The combination of Kinross's licences and applications with Orca's licence applications represents a strategic exploration portfolio in Côte d'Ivoire (See Figure 1 below). 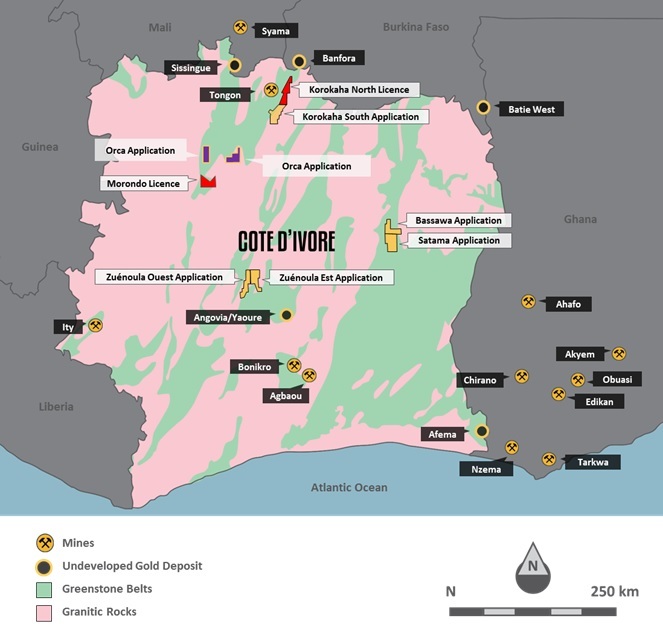 Commenting on the transaction, Rick Clark, CEO and Director of Orca, said, "The addition of the Kinross Ivorian exploration assets to our portfolio not only complements Orca's own licence applications in this highly prospective jurisdiction, but also helps the Company realize shareholder value through geographic and geopolitical diversification. We welcome Kinross as a significant shareholder of Orca going forward. Orca's management has enjoyed a long business relationship with Kinross and we look forward to working with Kinross to close the Acquisition and fast track an aggressive exploration program in Côte d'Ivoire." This press release contains forward-looking information and forward-looking statements within the meaning of applicable Canadian securities laws, including statements regarding Orca's (the "Company", the "Corporation", "we" or "our") plans and expectations relating to the expansion of its exploration activities to Côte d'Ivoire, including, but not limited to, the Morondo and Korokaha North exploration licences. These statements relate to analyses and other information that are based on forecasts of future results, estimates of amounts not yet determinable and assumptions of management. The assumptions, risk and uncertainties outlined below are non-exhaustive. Should one or more of these risks and uncertainties materialize, or should underlying assumptions prove incorrect, actual results, performance or achievements of the Corporation, or industry results, may vary materially from those described in this presentation. Forward-looking statements and forward-looking information are not guarantees of future performance and are based upon a number of estimates and assumptions of management at the date the statements are made including without limitation, assumptions about the following (the "Forward-Looking Factors"): successful exploration, performance of contractual obligations by counterparties; operating conditions; political stability; obtaining governmental approvals on time; obtaining licences and permits; government regulation of the Corporation's mining activities; market conditions; the securities market; price volatility of the Corporation's securities; currency exchange rates; foreign mining tax regimes; insurance and uninsured risks; availability of sufficient capital, litigation; land title issues; local community issues; and anticipated costs and expenditures and our ability to achieve the Corporation's goals. While we consider these assumptions to be reasonable, the assumptions are inherently subject to significant business, social, economic, political, regulatory, competitive and other risks and uncertainties, contingencies, many of which are based on factors and events that are not within the control of the Corporation and there is no assurance they will prove to be correct. In addition, a number of other factors could cause the actual results, performance or achievements of the Corporation to differ materially from any future results, performance or achievements expressed or implied by the forward-looking information, and there is no assurance that the actual results, performance or achievements of the Corporation will be consistent with them. For further details, reference is made to the risk factors discussed or referred to in the Corporation's annual and interim management's discussion and analyses on file with the Canadian securities regulatory authorities and available electronically on the SEDAR website at www.sedar.com, and those factors disclosed under the heading "Risk Factors" in the Corporation's documents filed from time to time with the securities regulators in the provinces of Canada4.. Although the Corporation has attempted to identify important factors that could cause actual actions, events, results, performance or achievements to differ materially from those described in forward-looking statements and forward-looking information, there may be other factors that cause actions, events, results, performance or achievements not to be as anticipated, estimated or intended. There can be no assurance that forward-looking statements or information will prove to be accurate, as actual results and future events could differ materially from those anticipated in such statements. Such forward-looking statements and information are made or given as at the date of this news release and the Corporation disclaims any intention or obligation to update or revise any forward-looking statements, whether as a result of new information, future events or otherwise, except as required under applicable securities law. The reader is cautioned not to place undue reliance on forward-looking statements or forward-looking information.